Everyone operates somewhere along a continuum from inward to outward. Our position on that continuum profoundly affects our performance, influence, and individual effectiveness. Similarly, the collective mindset of an organisation shapes its culture and performance. This 20-question Mindset Assessment gauges an individual's perception of their own mindset as well as that of their organisation. 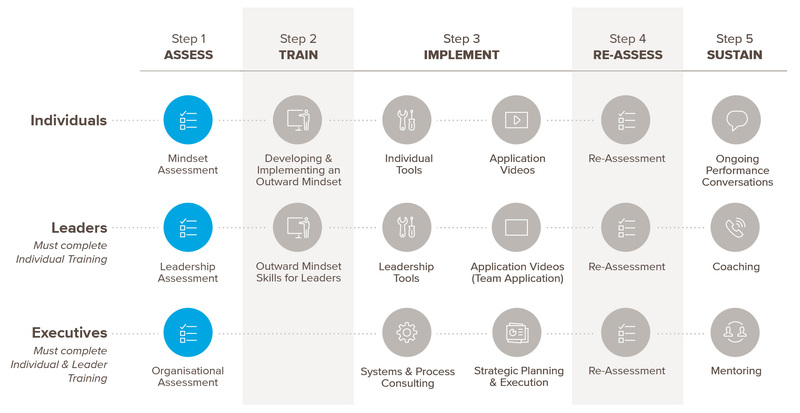 In addition to indicating location along the inward mindset-outward mindset continuum, the results provide additional insight into specific areas of strengths and opportunities. When organisations field this survey widely, they receive detailed insights into employees’ experience and perception of their work. Upon completion of the assessment, we present an analysis of the findings along with recommendations for steps to take to improve individual and organisational mindset and performance. Systems, policies, and other structural elements of an organisation heavily influence employee mindset and behaviour. Many organisations unwittingly incentivise or invite an inward mindset among employees simply by virtue of the legacy structures they have in place. For this reason, any organisational transformation effort must assess not only the human elements (mindsets), but also the structural ones. Virtually every organisation can change some aspects of their operations to help ensure their employees work with an outward mindset over the long term. In this assessment, Arbinger consultants work with organisations to review their policies, practices, structures, and procedures. We analyse these elements to determine which may be inviting or rewarding an inward mindset among employees, then recommend changes that will reinforce an outward mindset and reward results-focused, collaborative behaviours. If appropriate, we also provide support during the rollout and implementation of new policies, procedures and systems. This process, including the depth of review, is highly tailored to the needs of our client organisations. Prior to each assessment, we consult with senior leaders to determine specific goals and issue areas, then propose a timeline for the review.